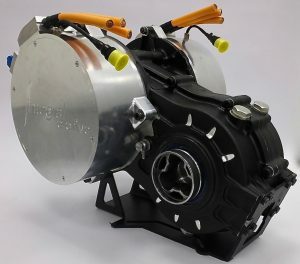 Hewland joined forces with Integral e-Drive at the recent 2017 Professional Motorsport World Expo in Cologne, Germany to exhibit an optimised EV driveline incorporating the Hewland PEVT-200 Transmission with the Integral Powertrain’s High Torque SPM Motor. The combination of the two products is a good example of how to build a high performance EV drivetrain. The PEVT dual motor torque-vectoring EV transmission is optimised for weight and performance. At just 18kg, the GEVT dual reducer is able to transmit up to 300Nm of torque and up to 20,000rpm per side, which provides a combined powertrain potential output of 500kW in a compact package. Integral e-Drive’s 4th generation automotive SPM motor delivers excellent power density and efficiency, realised through a combination of an advanced electromagnetic design, high conductivity encapsulation and a unique liquid cooling system. This powertrain demonstrates how the two companies can engineer for customers an extremely lightweight yet high performance electric driveline package. Hewland Engineering have a history of working with high performance EV projects including FIA Formula E and the Venturi EV land speed record car. Our range of standard EV transmissions are designed to provide a flexible solution to road and track EV designers.